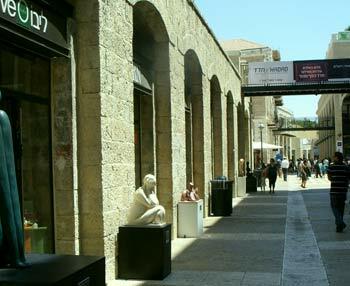 Mamilla Mall is the ultimate luxury Jerusalem mall. 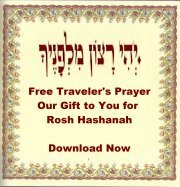 It's been touted as Israel's Rodeo Drive, Fifth Ave or Champs Elysees. Not only can you enjoy the fantastic view from outdoor cafes and stroll among centuries old buildings shopping for a Rolex or some diamonds at H. Stern, the walk will take you right to the Old City. 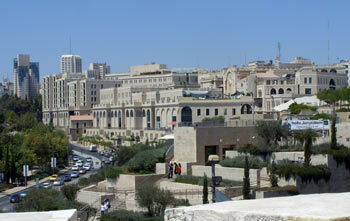 Today, Mamilla is a pleasant pedestrian mall, where street performers and cafes create a joyful holiday atmosphere. There's definitely an upper-class feel to the place, for the art on display consists not of cartoonists but of a rotating exhibition of large sculpture pieces, most of which are for sale. In between such stores as Tommy Hilfinger and MAC, you'll also find more approachable ones: a Superpharm pharmacy, a Café Rimon with a stunning view, a yummy ice cream store tucked next to the entrance to the Gap. It's a wonderful place to relax after a busy day of sightseeing. Make a stop at Steimatzky's, about half-way down the mall. Steimatzky's is Israel's largest bookstore chain. 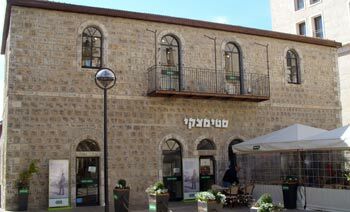 This one is notable because it is housed in the renovated Stern House, where Theodore Herzl stayed during his one and only visit to Jerusalem. The ground floor has English-language books for adults with a small selection of kids' books, as well as a restaurant. The renovated Stern House today, home to a bookstore and restaurant. Theodore Herzl standing in front of the Stern House as it looked then. 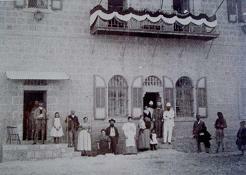 The house is an important piece of Jerusalem history for other reasons as well. 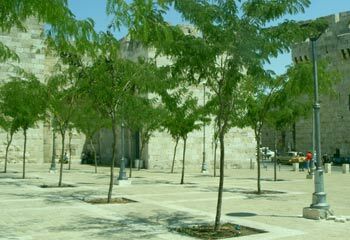 It – and the reconstructed facades of many of the other buildings along the mall – offer silent testimony to the acrimonious disputes, political and social, that underlie the Mamilla construction project. In the 1930s, this area was Jerusalem's bustling commercial center. Commercial life here practically ceased, however, in the last days of the British Mandate as the area turned into a war zone and, when the Arab-Israeli War of Independence ended, Jerusalem was a divided city and this area found itself right on the cease-fire line between Israel and the Jordanian Army stationed on the walls of the Old City looming above it. What once had been a chic neighborhood took the brunt of incessant Jordanian sniper attacks. The government used the dilapidated area to house poor Kurdish immigrants who had nowhere else to go; auto-repair shops opened up. Both endured frequent shooting and stone-throwing attacks for 19 years. In 1967, with the reunification of Jerusalem, the barbed wire came down and residents breathed a sigh of relief. 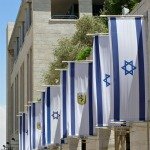 But soon municipal plans to revitalize downtown Jerusalem focused on the Mamilla area. Many landmark buildings had been so badly damaged by the years of fighting that they had to be condemned – including the Stern House where Theodore Herzl had stayed. Public outcry – and lawsuit that went to the Supreme Court – saved the house, which was taken apart brick-by-brick and moved to its present location. In 1972, the municipality approved the Safdie plan (named after Moshe Safdie, an Israeli architect), for a pedestrian mall, several luxury apartment complexes and hotels. The plan would require razing every existing building in the neighborhood, except the St. Vincent de Paul Hospice, and evicting all the residents. Sixteen years of arguments followed. Nevertheless, despite public protests, the entire impoverished immigrant population (over 700 families) was relocated to outlying neighborhoods to clear the area for development. When prices for the recently vacated lots soared and million-dollar apartments sprung up in their former home, the evicted families saw it as an injustice with strongly racial overtones. It took almost thirty years – years of political, business and social disputes - before the first phase of the project was official open. The affair left a bitter taste that lingers to this day. So while you stroll down the lovely pedestrian mall of present day Jerusalem, enjoying the luxuries, the pleasant atmosphere, and sip a coffee at a cafe overlooking stunning views of Sultan’s Pool, Yemin Moshe and Mishkenot Shaananim, take a moment or two to muse about its history – its bustling heyday in the 1930s, its fall, its present revitalization. 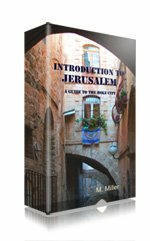 Mamilla's history, in short, parallels that of Jerusalem – one of dramatic changes, but inevitable rebirth. And to keep things in perspective, follow the mall through all this worldly sensuous enjoyment and you’ll find yourself at the entrance to the Old City and in another dimension altogether. This is Jerusalem, after all.